Keith Hamilton recorded 10 sacks for the Giants in 2000, and for the past 15 seasons that mark has stood as the team record for a defensive tackle. 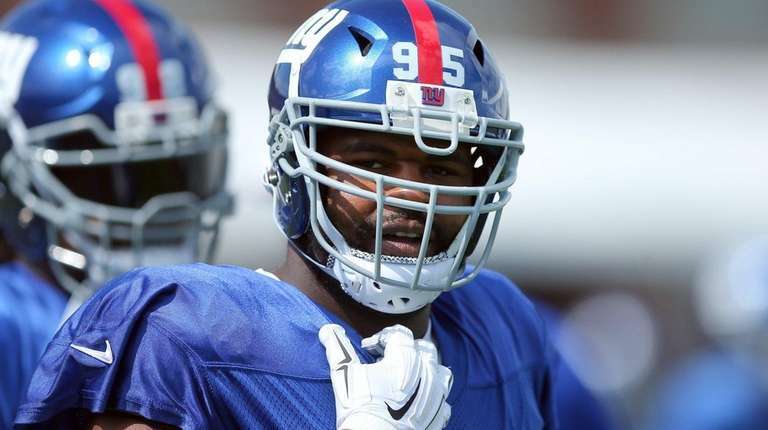 Now Johnathan Hankins has it in his sights, and he wants to blow right past it. Hankins, the fourth-year defensive tackle, said his goal this season is to register a sack per game. Sixteen. That would not only give him the Giants’ record for most sacks by a tackle, it would be the fifth-most in a season by any member of the organization. It would also make him a very wealthy man. Hankins is in the final year of his Giants contract and looking to wrap up his rookie deal with a bang. Given the contracts that were doled out for defensive linemen this offseason, if he can put up numbers half as good as his goal he’ll command big bucks in the offseason. But 16 is the magic number for him. He may have a chance at that. With the addition of Damon Harrison next to him to help stop the run — one of those big-ticket free-agent linemen mentioned earlier — Hankins figures to have more pass-rushing opportunities than he has throughout his career. For most of his tenure with the Giants he was the one who had to plug up the middle and be stout against the running backs. Now he’s the spry, tiny guy in the middle of the line compared to Harrison and Montori Hughes. In 2014, Hankins had a career-high 7.0 sacks. Those stand as the only ones he’s had in his career. Last year he played only nine games before a pectoral injury ended his season. Now he’s healthy and feeling excited about his role. It’s a newer role for Hankins. He may not get 16 sacks, but the Giants’ defensive line certainly has the potential to improve on last year’s dreadful pass rush. Besides Hankins’ new angle, they also added end Olivier Vernon and believe Jason Pierre-Paul will be more productive than he was when he returned from his hand injury last season.